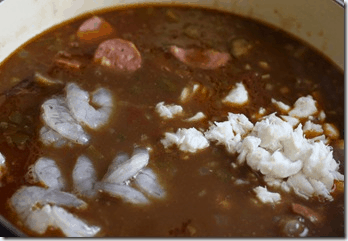 I knew when I saw the weather forecast for this weekend that I would make gumbo. 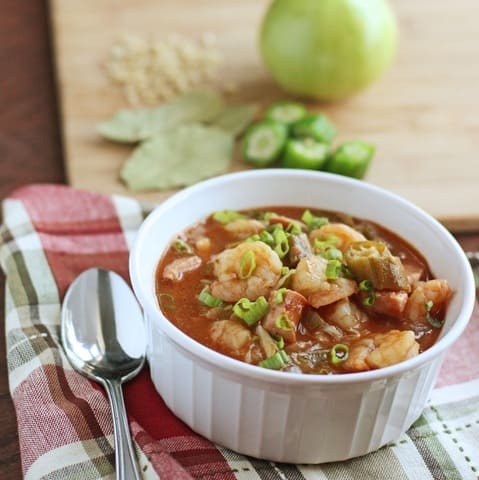 I love making chili in the first few cool weekends, but gumbo is something a little more special and fun to make. I basically get to tease butter and flour into a pasty perfection. One minute too long and I’ve got stuff that will set off fire alarms from 3 houses away. It is also the weekend for the a big college football rivalry—Alabama and Florida. It is our year to venture down to the swamp in Gainesville. Since it is an away game, I called up some family and asked if I could bring over a pot of gumbo and watch the game with them. Of course they didn’t mind and I now had two good reasons to play in the kitchen. I’ve made my grandmother’s recipe several times and it just gets better each time. You will need a large stock pot, at least 5 quarts. Cook time: 2.5 hours including roux. 1/4 cup flour-self rising or plain. hot sauce—subject to personal taste. I like mine a little milder, so 5 dashes. 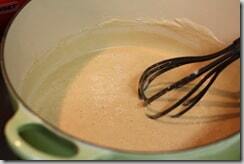 A roux is a mixture of a fat and flour that is the base and the thickening agent. You have to get the roux thick and dark, but not scorched. The color should be about the color of a penny. This is the most important part of the gumbo. 1. Chop the onions, celery, bell pepper. Do this FIRST. When the roux is cooking, you need to be close by to monitor it. 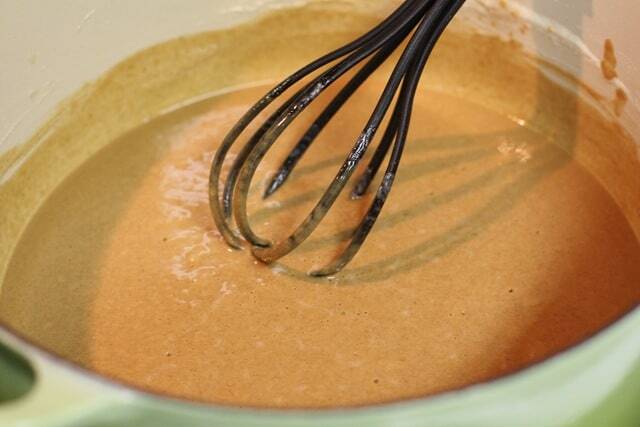 Many batches of roux have burned because the cook is chopping veggies. 2. To make the roux, put 1 stick of butter into your stock pot. Turn heat on med-high. Add 1/4 cup of flour. Stir oil and flour constantly until it is dark brown or copper colored, but not scorched. 3. Add chopped peppers, onions, celery, and chopped garlic. Stir quickly. This will slow the browning of the roux and quick cook the vegetables. 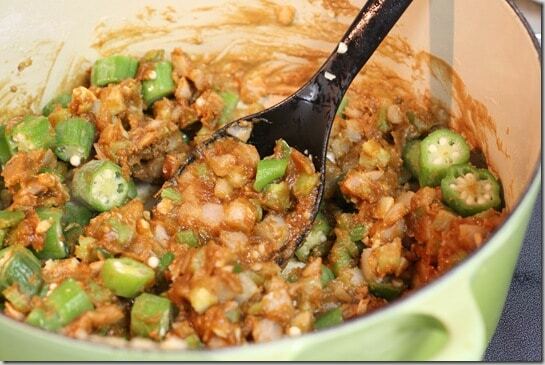 After they are coated (about 1 minute), pour in half a bag of frozen chopped okra. 4. Add can of tomatoes, crab boil pouch, chicken broth, chopped sausage and 2 bay leaves. 5. Stir everything together. DO NOT ADD SEAFOOD. Simmer 1.5-2 hours stirring occasionally. 6. Add seafood. Stir. Add gumbo file powder. I like to get a little soup in a bowl and mix the powder into that. Whisk quickly to break up lumps. Then pour the soup back into pot. This keeps the powder from lumping and allows you to incorporate it easier. Add hot sauce. Stir. Let this cook another 10-15 minutes so the file’ can thicken the stock. Remove bay leaves and season pouch. Serve over rice. Top with chopped green onions. I’m missing the sausage part in your recipe. 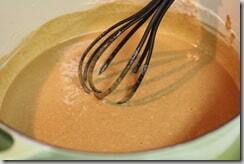 I have only heard of making a roux the color of a penny for gumbo to really enhance the flavor. One method I saw to achieve proper color of the roux is to cook it in the oven after toasting it (and before the fat, the flour itself) on the stove! I had never heard of it before but will definitely have to try it next time I make gumbo. There is nothing like a good gumbo, and this one looks delicious. Thanks for sharing. Yum! That looks much brighter and fhesrer than gumbo that cooks all day (don’t get me wrong, I’m not knocking the authentic stuff!! ).I found a technique for making the browned flour roux WITHOUT having to slow cook the flour in the fat for a long time, constantly stirring, hoping it doesn’t burn, etc. You can dump a bunch of flour on a sheet pan and bake it in the oven at the lowest temp possible (175-200F) for 2-5 hours – depending on how low your oven is, how much flour you have, etc. Get it dark brown – like the color you’d want to see used in your gumbo. The house’ll smell a bit scorchy, but you can make up a large batch of this, store it in the freezer, and then add spoonfuls as needed to thicken your next batch of gumbo. Lower fat, full’a flavor, and less time!